Cebada Wine’s tasting room is located just off State Street in the heart of downtown Santa Barbara. We feature Estate Grown, Burgundian style Chardonnay and Pinot Noir. You can even taste our Estate Blueberry Dessert Wine. Enjoy delicious treats from fruits grown on our farm, chocolate and honey parings and unique gift items. Our friendly atmosphere and beautiful view of the mountains creates the perfect spot for a relaxing afternoon sipping on our Sparkling wine or a romantic sunset Pinot, all served by our knowledgeable staff. This is a must stop on the Urban Wine Trail! We look forward to seeing you soon! We offer vertical tastings where you sip wine from different years and compare them. Or, just have your favorite wine by the glass. We offer Pinot Noir, Chardonnay, Rosé, Blanc de Noirs Sparkling or even our Estate-made Blueberry Dessert Wine “Forbidden Fruit Libation”. Pair them with any of the gourmet items in the store if you so choose; we aim to give you a unique experience not found anywhere else in Santa Barbara! 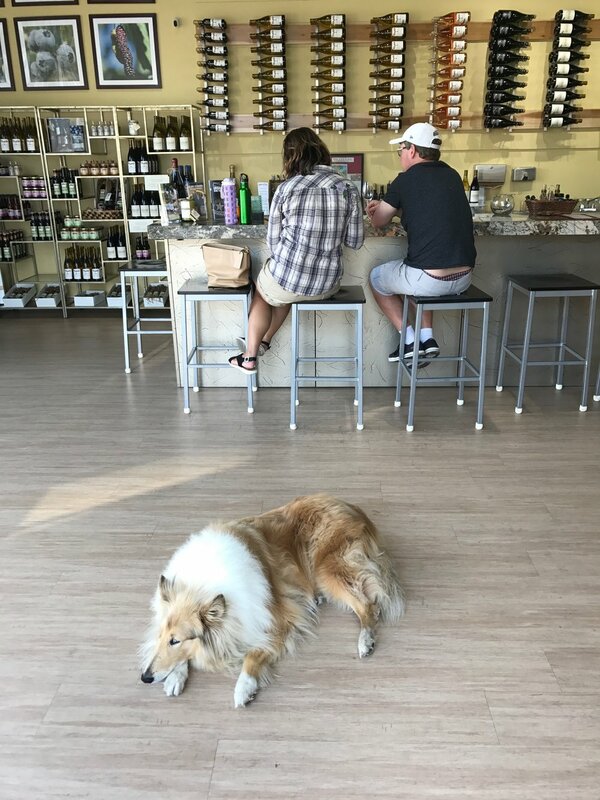 Our tasting room is also able to accommodate large groups of people, is dog and child friendly. If you are looking to make a reservation for a large group or rent out our tasting room, please call (805) 451-2570. Cebada’s Vineyard is a working farm that grows and vinifies estate grown Pinot Noir and Chardonnay located west of Sta. Rita Hills (inside the Santa Ynez Valley AVA) a mere 12 miles from the Pacific Ocean. Our boutique winery produces sophisticated Burgundian-style wines. The wines are low in alcohol and acid-balanced, making them the perfect food wines. We produce between 600-700 cases a year. All of our hand-picked grape clones are blended together to create great and ideal flavor profiles. These delicately crafted wines are made completely on the farm and available for purchase on the farm (by appointment), or in the downtown Santa Barbara tasting room. Rex Pickett, author of Sideways and Vertical, wrote, “Cebada wines showcase tremendous finesse with bright fruit and intense complexity. These are small batch wines crafted with care and passion”. 8 East De La Guerra St.